It’s December! Can you believe it? Only 25 days until Christmas, and I’m determined this holiday season to keep my heart focused on CHRIST, where it belongs! To get us started,I thought an Advent Calendar would be in order. This printable requires three pages. I used red and green cardstock and printed a complete set in each color. Next, cut the strips apart. I used a large paper trimmer for this step, but scissors will work, too! If you have little ones, they’ll get good practice cutting along the dotted lines. 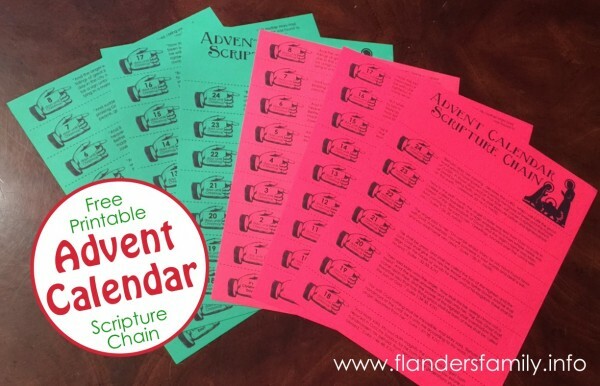 Since I printed two sets of Scripture verses, we were able to alternate colors in our chain. Doesn’t that look pretty? 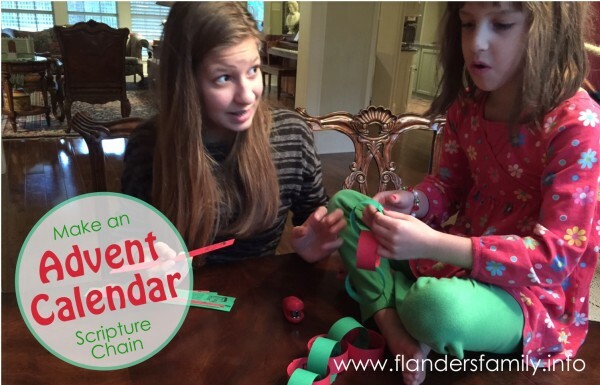 We made one chain to keep and another to give to the grandkids, so they can count down the days till Christmas at their house, too. 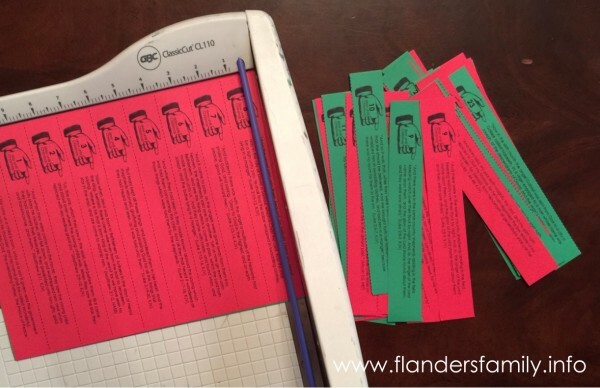 We used a stapler to join the ends of the links together — it’s fast and easy and makes no mess — but double-sided tape or a drop of school glue will work just as well. 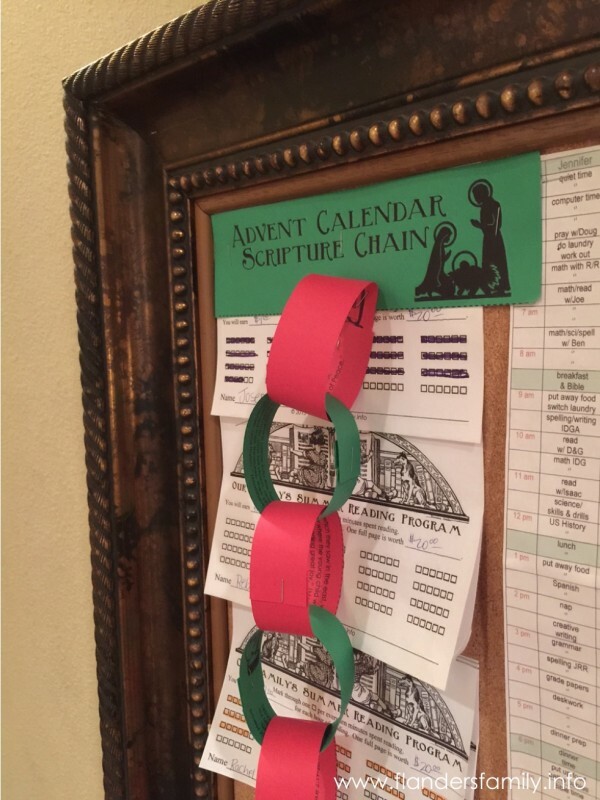 Once your chain is assembled, hang it up (we posted it on our bulletin board), then remove one link a day and read the Scripture together. 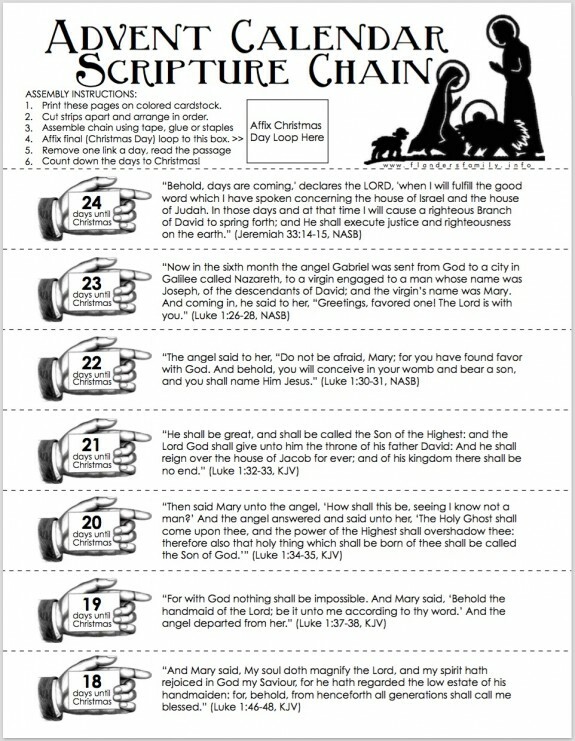 The little graphic on the side of each strip will help you keep track of how many days are left until Jesus birthday (24 and counting)! I hope you’ll come back again soon — I’ll be sharing ideas and activities all month for keeping CHRIST first and foremost this CHRISTmas! 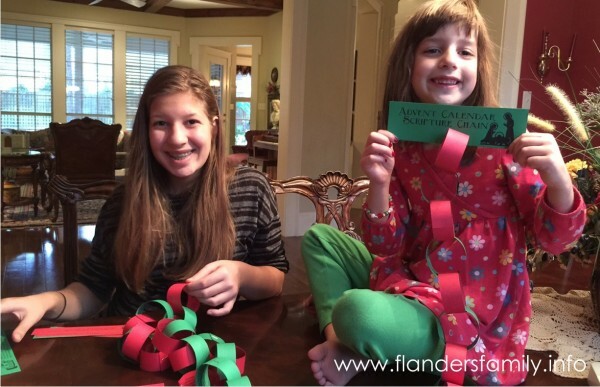 « Mailbag: How Do You Handle Gift Giving? I loved your Christmas chain. Do you have one for Easter, 40 days of Lenten? Thank you. Vicky M.
Not yet, Vicky, but that’s a great idea. Thanks! I’m working on one even now and hope to publish it shortly, so stay tuned…. Okay, the Easter/Lenten chain is now a reality, Vicky. You can download it here. Thank you so much for the Advent Calendar. This will be our first, and it looks perfect to reinforce our study of Jesus’ birthday as we share the events leading up to His birth with our toddler. God bless you and your family. I’m so glad you like it, Crystal. May God bless you and your sweet family with a very merry and meaningful Christmas!